Tracks made by dinosaurs the size of sparrows have been discovered in South Korea by an international team of palaeontologists. University of Queensland researcher Dr Anthony Romilio was part of the team which described the tracks, which were originally found by Professor Kyung Soo Kim from Chinju National University of Education, South Korea. “These 110-million-year-old footprints and trackways were made by carnivorous dinosaurs commonly known as raptors,” Dr Romilio said. To estimate the size of the dinosaur that made the tracks, the team measured the footprint length and multiplied the value by 4.5 to get an approximate hip height. “The diminutive sizes of these new tracks are extraordinary; the tracks were made by tiny dinosaurs about the size of sparrows,” Dr Romilio said. The research team are unsure if the tracks were made by a small adult species, or baby dinosaurs. 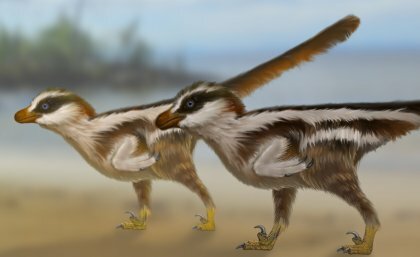 “Very small dinosaur species like the Chinese Microraptor were crow-sized, but these had feet too large to match the South Korean footprints,” Dr Romilio said. Professor Kim said the Cretaceous lake deposits at the discovery site created perfect conditions that allowed for the preservation of tiny footprints rarely found elsewhere. “In addition to tiny dinosaur tracks, we have footprints made by birds, pterosaurs, lizards, turtles, mammals, and even frogs,” he said. “We have named these small tracks Dromaeosauriformipes rarus, which means rare footprints made by a member of the raptor family known as dromaeosaurs,” Professor Kim said. Let's hire a few to catch rats.